Best CD hi-fi system for £2500 | What Hi-Fi? Reports of the demise of the CD have been greatly exaggerated. It’s true that, sandwiched between the ever-growing popularity of streaming services and the vinyl revival, CDs feel like the ignored middle child. But don’t dismiss those shiny discs so easily – CD isn’t dead. There’s still life left in the format yet. What is certain is that there simply isn’t an abundance of great-sounding mid-market CD players out there. We had a hard time building the best CD system at this price. If you’re on a stricter budget, the Marantz CD6005 is your best bet at £300. However, for the next step up in performance, you’re looking at something like the Audiolab 8200CD at £800 and higher. And at £1080, the Naim CD5si is yet another step up. It’s only natural that we’d want to partner the Naim CD player with its matching amplifier, the Naim Nait 5si. The £990 amp is a former Award-winner, and sonically it’s near-impossible to tell where the CD player ends and the amplifier starts. But when it comes to speakers, we know exactly what will match. The memory of the superbly entertaining Triangle Esprit Titus EZ speakers is still fresh in our minds, and not just because of that gorgeous finish and distinctive shiny tweeter design. Their winning sense of agility, precision and musicality still excites us, and works brilliantly with the punchy, insightful character of the Naim components. It’s an exciting performance. There’s power and muscle behind the sound, but the overall impression is of unbridled drive and enthusiasm. The Triangles zip along with glee no matter what song you throw at them, with an accurate ear for rhythm that will keep your toes tapping and your head bopping. The Naims are similarly driven in nature, favouring pure enjoyment over transparency. There’s a stunning level of detail retrieval: the growling edges of Corey Taylor’s voice on From Can To Can’t are fleshed out, sounding intimate and expressive as the song increases in intensity. Drums hit with impact, guitar strums are layered and sound almost tactile – there’s a satisfying sense of weight that underpins the sound. What we’re most impressed by is just how cohesive the system sounds together. The individual strands of The Dead Weather’s 60 Feet Tall are easy to pick out in the larger soundstage, but it takes real skill and precision to sustain the sense of tension and brooding atmosphere present in the song. Crashing cymbals and blaring trumpets have plenty of breathing space to hit their high notes, but the Naims have a slightly rolled-off treble that prevents the sound from getting too shouty or bright. It works beautifully with the Triangles, whose spiky treble is kept in check. This does lend an attacking tone to songs, though, which makes it all the more exciting to listen to. Dynamic upheavals are handled with authority and subtlety. The system’s accurate grasp on rhythms takes any abrupt changes in pace in stride: Sia’s Chandelier spins and turns gracefully, and the system never misses a beat as the song slows down and ramps up throughout. The Naim CD player and amplifier are identical black boxes machined out of aluminium. Not just any aluminium either – very heavy aluminium. There’s something about a sturdy, hefty piece of hi-fi that exudes a premium quality feel, and the Naims’ construction and finish won’t leave you feeling short-changed. After a while, the discreet finishes make them almost invisible in your room. Only the subtle glow of green LEDs – the simple display, the ring of light around the input buttons, and the volume level indicator – make their presence felt. The Naims may look plain, but the Triangle Esprit Titus EZ speakers demand attention. They are quite compact speakers, but they make a big impact. The smooth finish – in either walnut, black or white – is impeccable and feels of a much higher quality than a £600 price tag would otherwise suggest. The pointy, horn-loaded titanium tweeter adds some much-needed glitz and style to this system. We’ve long admired the CD5si’s manual swing-drawer mechanism. It makes loading CD discs that bit more involving. The drawer opens and shuts smoothly and silently, and the CD player reads the disc the second the drawer is closed. Don’t forget to unscrew the transit bolt holding the drawer in place (it’s underneath the unit), otherwise it won’t open. You also don’t want to lose the magnetic puck that goes on top of the discs to hold them in place. The CD simply won’t read the disc if it isn’t there. The only connections on the Naim CD5si are a pair of RCA outputs and a DIN connector, which connect straight into either the DIN or any of the three line level inputs available at the back of the Nait 5si amplifier. A DIN cable is helpfully included in the box. It’d be nice if there were some digital outputs alongside the analogue ones, as it takes the upgrade potential out of the equation. There’s no power supply input either – an unusual choice for Naim. However, there is a 6.3mm headphone port on the amplifier’s front panel. Make sure you run in the entire system for a good few days to get them sounding their best. The Naim products open up, sound cleaner and more full bodied after about a weekend’s worth of running in, while the initially somewhat spiky treble on the Triangle speakers calms down eventually. We would recommend toeing in the speakers slightly towards your listening position, too. It’s a simple, fuss-free set up, with very few features to make a song and dance about. Playback functions and repeat options are present on the CD5si, all of which are mirrored on the remote. You’ll get the same well-made remote with both Naim components, so pairing them has the advantage of being able to use just one control for both. The amplifier responds to volume changes instantly. Press the buttons to switch inputs or skip to a particular track, and the action happens instantly. There’s no lag or hesitation and, best of all, the overall operation is so straightforward and swift that it becomes second nature to use. As far as systems go, this is one of the most enjoyable performances we’ve heard at this price. 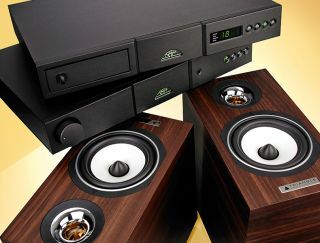 The Naim/Triangle system is full of energy, and it couldn’t be simpler to use. The premium quality components are worth every penny, but it’s their infectious enthusiasm and superb rhythmic precision that you’ll love listening to for hours on end.